Thirty companies will be vying for top honours in the fifth edition of the South African Premier Business Awards. Winners will be announced at an awards ceremony that will take place at the Sandton Convention Centre on 30 January 2018. The awards are presented by the Department of Trade and Industry (the dti), in partnership with Brand South Africa and Proudly South African. Anticipation is reigning supreme among the companies that will be battling it out for the first prizes in the ten categories, but all eyes will be on Ndoukhulu Hydraulics and Mining Supplier. The company, which is based in Johannesburg, where it manufactures, repairs and refurbishes hydraulic cylinders, is leading the pack with nominations in three categories. These are Black Industrialists, Manufacturer and SMME Awards. The Managing Director of Ndoukhulu, Mr Matome Manenzhe could not contain his excitement when he learnt that his company has been presented with three opportunities to romp home with a prestigious award at the ceremony. “We are honoured, humbled and privileged to make it as finalist in three categories. This is a great source of inspiration to everyone who is involved with our company, from our employees to our clients. To us making it this far is a great achievement that we will cherish for a long time as we are a relatively new and small company. 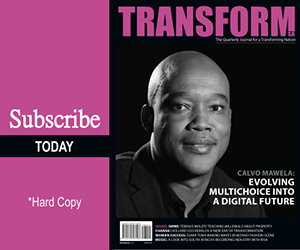 Winning an award will be a cherry on top,” says an elated Manenzhe. He adds that he views his company’s nominations as a recognition of its small but commendable contribution in job creation, industrialisation, youth development and skill transfer. 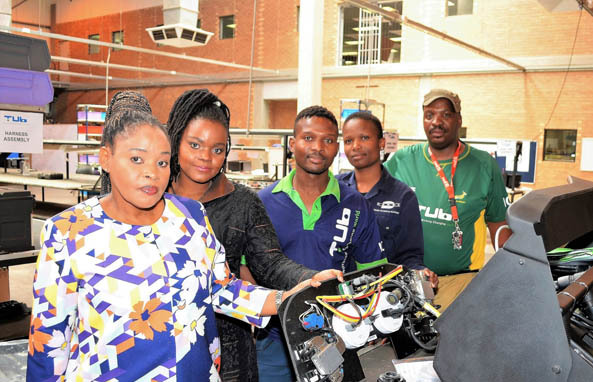 Another company on which the spotlight will shine prominently at the ceremony is Thatha Ubeke Manufacturing, which is based in Boksburg where they manufacture electrical and electronic sub-systems for the domestic and export markets. The CEO of Thatha Ubeke, Ms Nana Sabelo is optimistic that they will successfully defend the Black Industrialist Award which they won when it was first presented in 2016. However, a double is on the cards this year as they are also finalists in the Manufacturer Award. “We are thrilled about being nominated twice. It shows we are not a one-time wonder and that we did not rest on our laurels after winning the inaugural Black Industrial Award. We are confident that we are ticking many of the boxes that are in line with the country’s economic objectives. 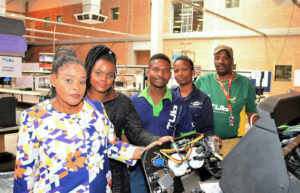 We are a 100% black, woman-owned company operating in the advanced manufacturing sector where it is creating jobs for predominantly young people and exporting products,” says Sabelo. The Chief Operating Officer of Memeza Shout, Ms Elmarie Pereira is confident that it will be second time lucky for her social enterprise which is nominated for the SMME Award after failing to make the cut in the last edition. Memeza has provided South Africa with the first public alarm system that is linked to the police and community police forums. According to Parreira, the SAPS-endorsed alarm system enables ordinary South Africans who cannot afford private security to have access to safety and security. “We have been working on the roll-out of the public alarm system for four years. Being nominated as a finalist in the national premier business awards means that our company and efforts are being recognised and that the work we are doing is making an impact in the vulnerable communities that we are working hard to assist. Winning the award will prove that we are on the right track as a social enterprise. It will also encourage us to continue with our work in order to contribute in combating crime in South Africa. The initiative is also about community upliftment and job creation,” says Pereira. The awards are sponsored by Wits Business School, Johannesburg Stock Exchange, Tsogo Sun and Old Mutual.